I have created Guarded Key database on my desktop/laptop computer, but I would also like to access my data on iPhone and iPad. I have downloaded Guarded Key app for iOS on my devices. What now? How can I put my database on these devices? Connect iOS device to your computer. Start iTunes app, if iTunes does not start automatically. Open page for the conected device and select tab "Apps". Scroll down to panel "Apps" and select "Guarded Key". On the right side you can see an empty panel Documents. This is the place where we need to copy our encrypted database (GuardedKey.edb file). /Users/username/Library/Containers/ com.guardedkey.GuardedKey/ Data/Library/Application Support/GuardedKey. This is required by Apple product design rules for sandboxed applications. However you may have copied the app and data to some other place, for example USB drive (works only with app downloaded from our website, not when downloaded from Apple App Store). In that case you will locate GuardedKey.edb file in the same folder where the app bundle (or executable file) is stored. In our example we assume standard installation on Mac OS X in /Applications folder and data stored in the secure container. Use "Drag & Drop" to copy database on your device. Use mouse or track pad, click on GuardedKey.edb file and hold down the button. 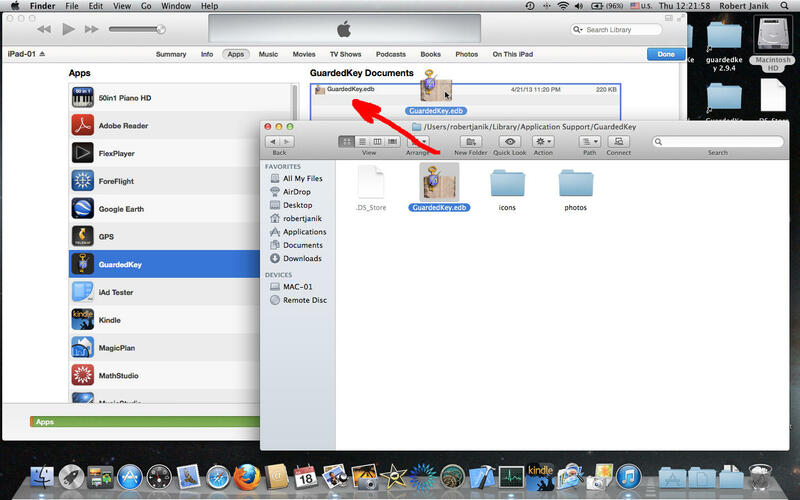 Drag the file over to the "Documents" panel in the iTunes window. 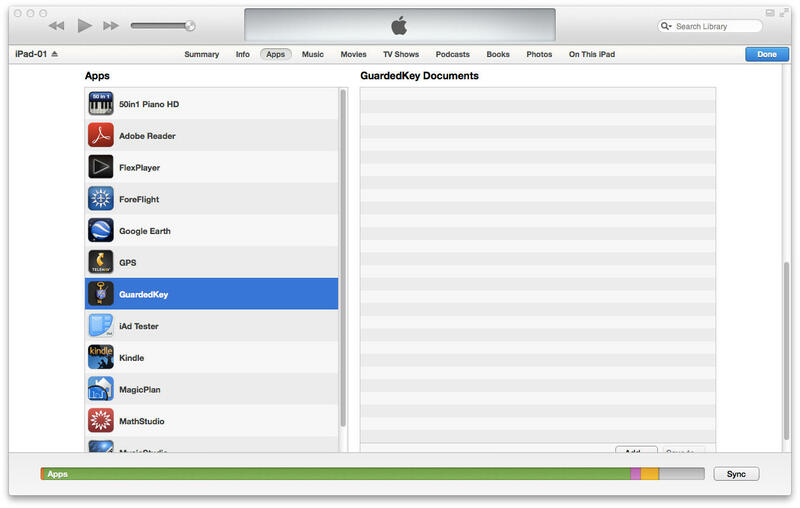 Now you can start Guarded Key app on your iPhone/iPad. The app will load the database and you can sign in. After successful transfer of the database to iOS device, it is a good idea to Download Icons and Photos. Well done! Now you have mobile Guarded Key.